PHILADELPHIA – Oleksandr Gvozdyk indicated that he didn’t want to insult Doudou Ngumbu. 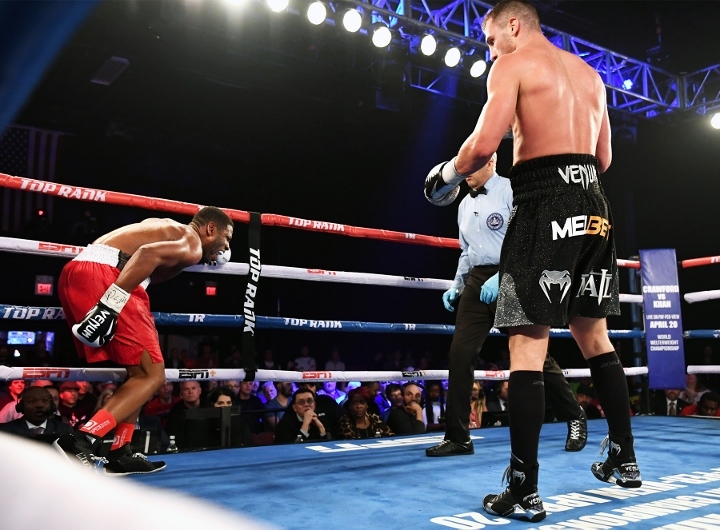 Gvozdyk questioned Ngumbu’s effort while talking to a group of reporters following his fifth-round, technical-knockout victory Saturday night at 2300 Arena. The unbeaten Ukrainian champion had hoped to score a more definitive win against an overmatched opponent against whom he was listed as a 100-1 favorite by numerous Internet sports books. “I’m satisfied I won,” said Gvozdyk, who owns the WBC light heavyweight championship. “I keep my title, but how it happened I’m definitely not satisfied with. The people that came here aren’t happy, and it’s important to make your fans happy. Ngumbu began limping and went down to the canvas during the fifth round of a scheduled 12-round, 175-pound championship match. He repeatedly grabbed at his right calf and conferred with those in his corner before they informed referee Eric Dali that Ngumbu couldn’t continue. The emotional, 37-year-old contender collapsed in a neutral corner after the bout ended and had to be consoled. Officials indicated that Ngumbu (38-9, 14 KOs) had suffered an injury to his right Achilles’ tendon. The 31-year-old Gvozdyk (17-0, 14 KOs) made the first defense of the WBC light heavyweight title he won by knocking out Adonis Stevenson in the 11th round of their December 1 bout in Quebec City, Canada. Stevenson suffered a brain injury during that defeat that temporarily left him in a medically induced coma. The Haitian-born, Quebec-based Stevenson since has begun a rehabilitation program and is recovering slowly but surely.